The current state of the art in the study legal argumentation may be characterized by the applicability of a great variety of concepts, distinctions, frameworks and methods which have been employed in dealing with a rich phenomenon of legal argumentation. Although many of these diverse tools are well-developed, in our opinion insufficient attention has been paid to the meta-level discussion between the representatives of various methodological traditions, including, in particular, the legal-theoretical, the philosophical and the logical perspective, as well as the point of view of computer science with focus on AI research. The aim of the workshop is to provide space for exchange of methodological ideas concerning the research on legal argumentation from three perspectives: AI and Law, argumentation theory and legal theory. There is strong need for cooperation and mutual inspiration between these three domains of research in order to develop more effective, accurate and scientifically adequate theories and models of legal argumentation. Thorough discussion of scientific aims and adopted methodologies is needed in this field. This may lead to establishing of interdisciplinary research projects related to legal argumentation. The organizers intend to publish post-proceedings in a prestigious journal. The installation for submission of papers will be established soon. The participants of the first MET-ARG workshop are welcome and encouraged to take the opportunity of participating in the 14th Computational Models of Natural Argument (CMNA) workshop (the registration for MET-ARG allows to participate in 14th CMNA free of charge; both workshops will be organised on the same day). MET-ARG participants might be particularly interested in the fact that one of the key topics of the CMNA meetings is dedicated to methods of studying arguments in the natural language communication -- what is a crucial aspect of the research on legal argumentation as well. Organised since 2001 by Floriana Grasso (University of Liverpool, UK), Nancy Green (University of North Carolina at Greensboro, US) and Chris Reed (University of Dundee, UK), the CMNA workshops are widely recognized as one of the most significant and influential meetings focused on natural argumentation and argument technology. The former workshops took place e.g. in Hyderabad (India), Lisbon (Portugal), Pasadena (USA), Patras (Greece), and San Francisco (USA) (for more details see http://www.cmna.info/). Cross-disciplinary approach. Which (if any) methodological ideas, concepts and distinctions specific for each of three disciplines (AI & Law, philosophy of argument and legal theory) may turn out to be instructive/inspiring for the others? Top-down and bottom up approaches. Should legal argumentation be analyzed from the point of view of “first principles” approach or should it begin with concrete real-life examples? Is there a middle ground between the two? Formal and computational vs. informal models. How can logical tools contribute to analysis of actual legal argumentation? Are semi-formal and informal approaches more fruitful? From law through argumentation theory to AI and back again. How do presumptions of any of these fields determine the scientific method and the obtained results? Descriptive and normative models. How do lawyers argue? How should they? Arguing about rules, cases, evidence. Does the method differ in research on legal argumentation in different domains? 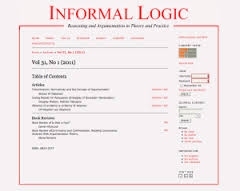 The peer-reviewed papers from 1st MET-ARG are published as a special issue of the journal Informal Logic (Michał Araszkiewicz, Tomasz Żurek, Eds. ; vol. 3, 2016; University of Windsor, Canada). Panel session "Force of Legal Arguments: Contemporary Perspectives and Methods"
We call for participation in the workshop. The registration panel will be accessible through the main JURIX 2014 website. IMPORTANT: The registration fee will also cover the participation in the CMNA workshop (to be held on the same day as the MET-ARG workshop, in the same room but different sessions).